Oh, the Internet and its memes. You cannot stop them. 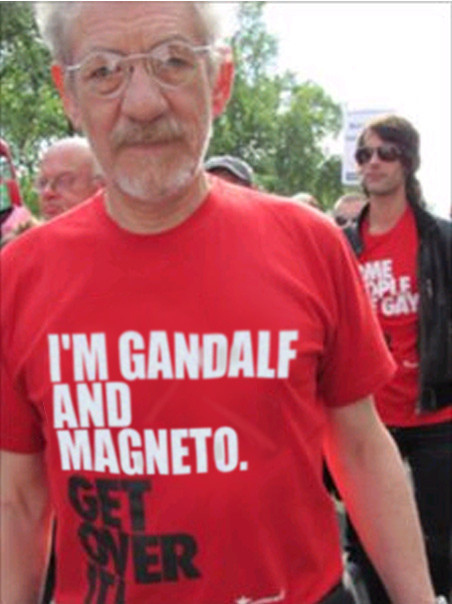 I saw a photo (by Dhruti Shah) of Sir Ian wearing the shirt and with my lightning wit, I decided to photoshop the tshirt so that it read “I’m Gandalf and Magneto. Get Over It.” It took me 15 minutes. I didn’t do it as a piece of political satire or to attack either Stonewall or the Pope. It was just me being silly. I put it on Twitter. Then people started retweeting it. A lot. The comedian/actor Simon Pegg didn’t realise it was a photoshop job and retweeted it to his hundreds of thousands of followers, giving the impression that Sir Ian was actually wearing a Magneto-related tshirt (he later realised it was a fake and correctly attributed it to me. Thank you, Simon). The Internet went crazy. Most of my twitpics are viewed 300-600 times. In two days it was viewed over 250,000 times. 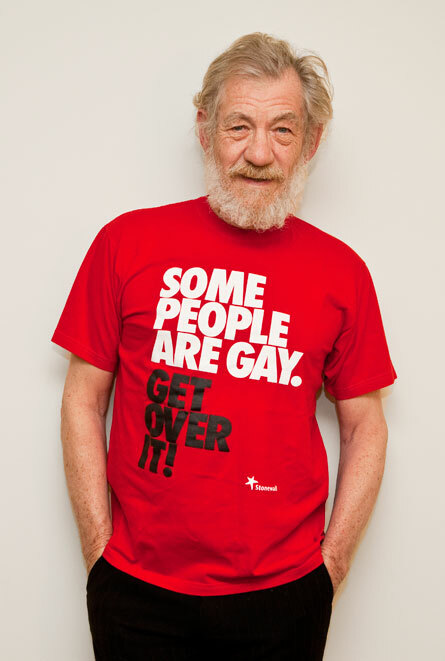 Amusingly, people loved the tshirt and thought it was great that Ian McKellen was wearing it. I tried to make it clear that none of it was real, but by this stage it was out of my hands. The picture was no longer merely on my Twitpic account – it had been copied onto thousands of blogs and tumblrs. 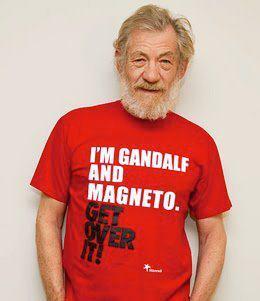 A cursory google of Ian McKellen Gandalf Magneto tshirt reveals page after page after page of pics. 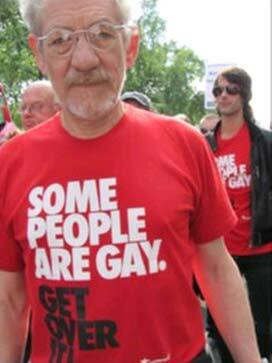 The odd, and somewhat frustrating aspect of this is why someone would bother to photoshop Ian McKellen with a slogan that isn’t even their own. I half expected my photoshop job to turn into a meme in which everyone inserted their own slogan, which at least demonstrates some creativity. But why someone would go to the trouble of repeating my “joke” with a different photo, I just don’t know. Anyway, it’s nothing to do with me. Now, as with so much on the Internet, it belongs to history and to excited Brazilians leaving enthusiastic comments on Twitpic. The eerie thing about all such memes/phenomena is how quickly they spin out of your own control. You just have to sit and watch it blow over. UPDATE: It’s January 2012 and the meme has mutated. 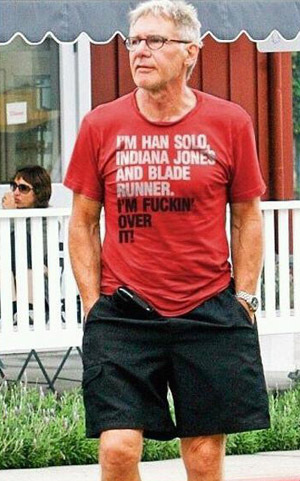 Over the last day or so people have brought my attention to a photo of Harrison Ford that is sweeping The Internet. Unless there’s a hidden side to Harrison Ford and he has an unexpectedly nerdy sense of humour, I assume it’s a Photoshop. Also, the fact that it has three roles in it (Han Solo, Indiana Jones and Blade Runner) as opposed to two in the Ian McKellen pic means that eventually these spoofs will be like IMDB entries, with full lists of every actor’s roles, all in chronological order. Given the way these things go, it’s inevitable that one day in 2015 a minor celebrity will wear an actual tshirt based on the Gandalf/Magneto meme. (I’m betting on a haggard Steven Seagal wearing a “I had a ponytail. Get over it!” shirt.) I may have to strangle them with my bare hands.